Hi, today I have another tutorial. 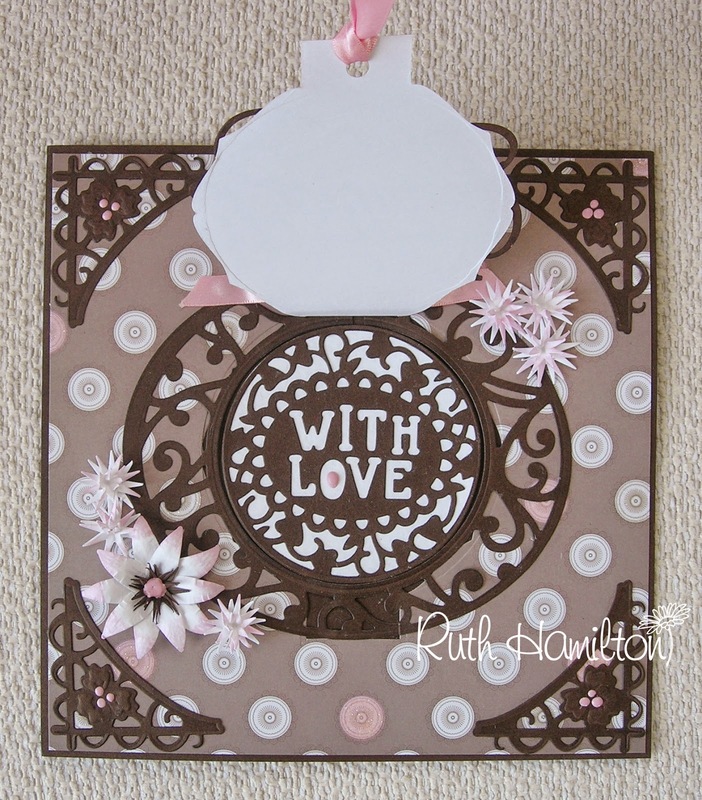 This time I've used the Tonic Studios With Love Pop Up Sentiment die as the main feature in the centre of the card. 1. Place the outer pop up sentiment die in the centre of the patterned paper and tape down. Pass through your die cutting machine. 2. It will look like this. 3. Place your ruler along the bottom of where the die cut is still attached to the paper and cut straight across. 4. Using both dies from the Looking Glass Oval die set cut out the shape from brown card. 5. Cut out the centre with the circle die from the With Love set. 6. Die cut the With Love from the brown card and cut another circle from white card. 7. Glue the brown part on top of the white circle. 8. Attach the patterned paper to the card blank with DST and glue the With Love circle in the centre. 9. Snip through the top centre of the Looking Glass oval and remove the tiny patterned piece shown. 10. With this little piece removed it will fit around the "flap" of the card as shown. 11. Punch a hole in the centre of the "tab"
12. Now add a piece of ribbon through the punched hole to act as a tab. That's the "pop up" part finished and now you just need to decorate the rest of the card. You need to add a matching bow at the top of the "pop up" to cover the cut part of the Looking Glass die cut. 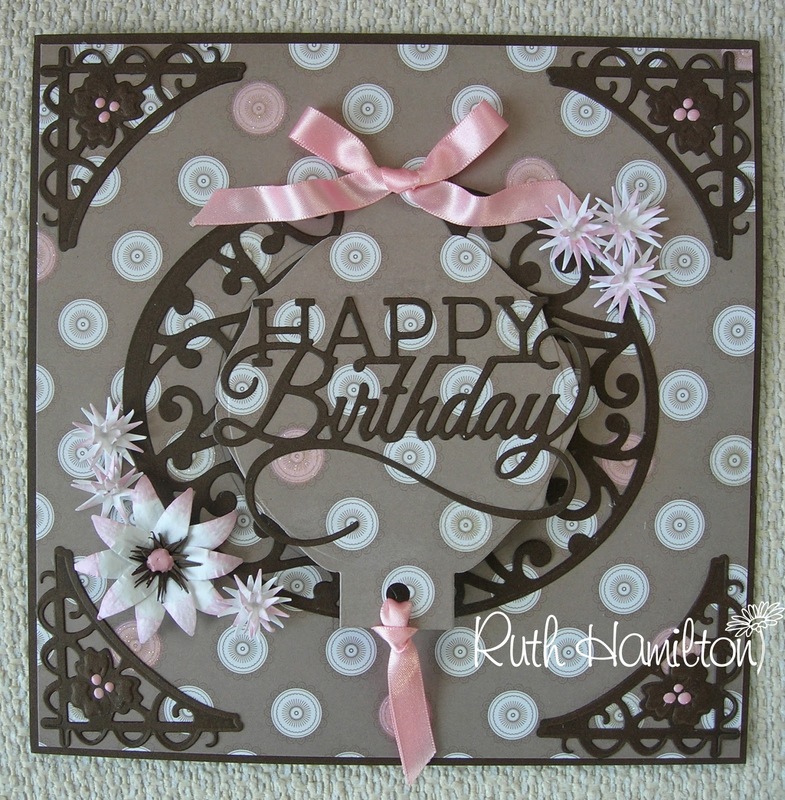 I have added a Happy Birthday sentiment across the centre, 4 Pansy Arch corners with Cosmic Shimmer dots and some flowers made with the Tonic Studios Carnation, Sweet William, Peony Punch and Stamp set. You can see lots more ideas and tutorials on my own blog - A Passion for Cards.